and is Co-hosted by Chrystal of Snowdrop Dreams of Books, Aislynn of Stitch Read Cook & Carmel of Rabid Reads! 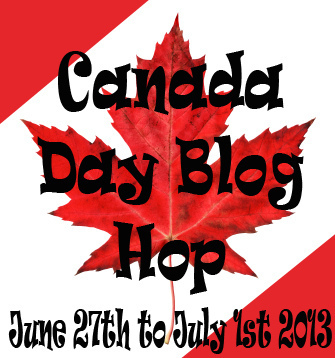 In honour of Canada‘s birthday we are having a Canada Day Blog Hop extravaganza! Each blog will host their own giveaway – Canada themed of course! In honour of my Canadian family (Hi Grandma, Grandpa, aunties, uncles and cousins! *wave*) I’m giving away one of my favourite books about Canada and which one will be a surprise 🙂 I will tell you about it as soon as the winner has it! The winner will be notified via e-mail. If the winner does not respond within 72 hours, another winner will be drawn. Thank you for being here 🙂 Happy (almost [haha I love that “almost”]) Canada Day! Happy belated Canada Day Denise 🙂 Thanks for following! I hope you’ll enjoy my blog!